Do you recall my good friend Wendy and her visit a bit ago? I told you we had lots of fun hanging out. We went to a very cool indoor climbing playground one day, then we met up for pictures the next day at a park full of birds and trees and mud and other such wonders and our kids played in between shots. 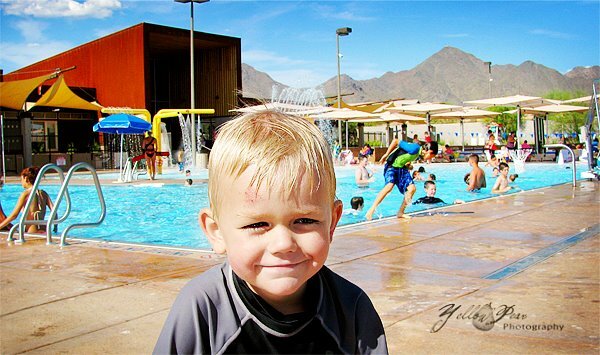 Then on their final day here we went to a fun aquatic center in the eversoglamorous Scottsdale! 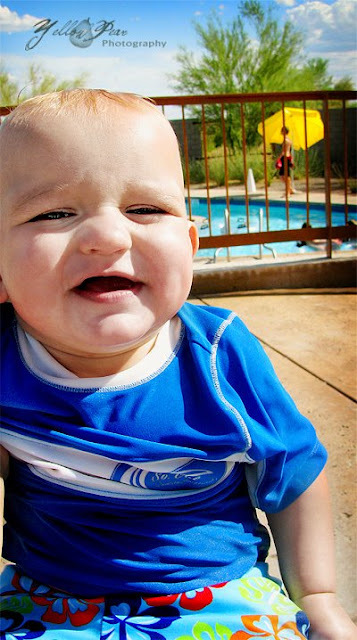 I was stoked about the Lazy River. 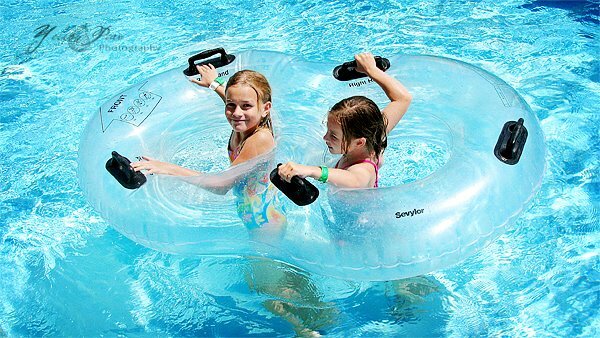 Imagine lazily floating atop a shimmery tube in the glorious water round and round and round. I love Lazy Rivers, I really do. Only it didn't happen just like that. I forgot about the munchkin factor. In reality, first both Dennis and Q had to be stuffed into lifejackets. Then we had to secure a tube. Except doubles were hard to come by and I finally just grabbed a single. Then Dennis who had recently been roused from a nap during the drive over, decided to be scared about the 'Crazy' River and was protesting none too quietly, and by this time we were in the on-ramp-thingy that leads out to the river and lets you get situated and were holding up traffic big time! I was trying to hold a lifejacketed Q who was wriggling like mad and at the same time desperately endeavoring to talk Dennis into all the fun we were going to have and keep all three of us in the SINGLE tube! We finally managed to get going without any casualties, but Q detested the lifejacket and tried to climb up my stomach and away the entire time. And you'd think those chubby feet of his would be squishy or something, but no, they made for some extremely sharp jabs that combined with the strain of holding two kids in one tube left me quite sore the next day. I did not intend to be sore from the LAZY River. Such is the life, I suppose, on the Calm-Defying, Muscle-Straining River that it turned out to be. Miss B had more of the experience I had been dreaming of with her new buddy. I should go back and leave Q with a babysitter. 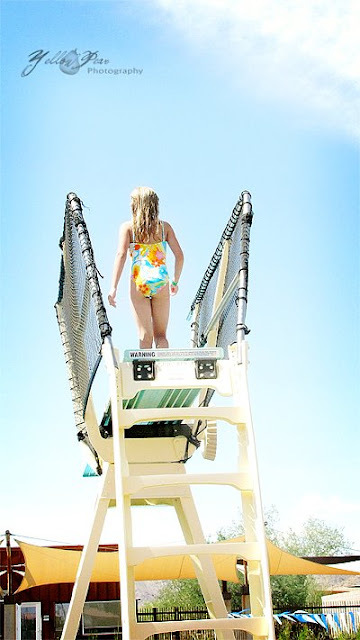 They also quite enjoyed the high dive. Here they are explaining how it takes 3 whole seconds until you hit the water! What a rush. I hung with the two little boys and Wendy and her kids. Q thought it good fun. So did Dennis. If you look in the background of the picture below, you can see all the fun splash stuff they had as well to keep the little ones occupied. Then a picture of Yours Truly taking a break in the shade whilst Q ate his lunch and had a nap. Mr. C was visiting grandparents so he missed out on the adventure, although he had lots of his own. 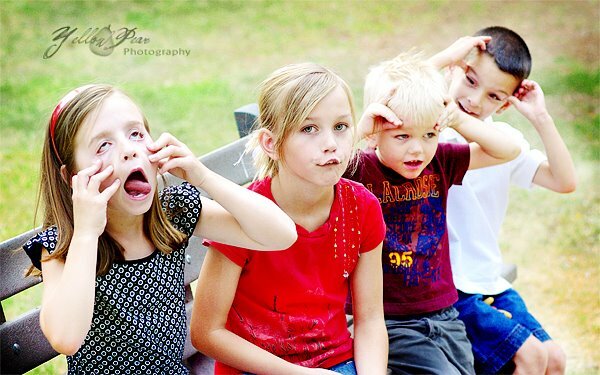 And here's a shot of the second generation friends at the park in between pictures making silly faces! Looks like a dream!!!! 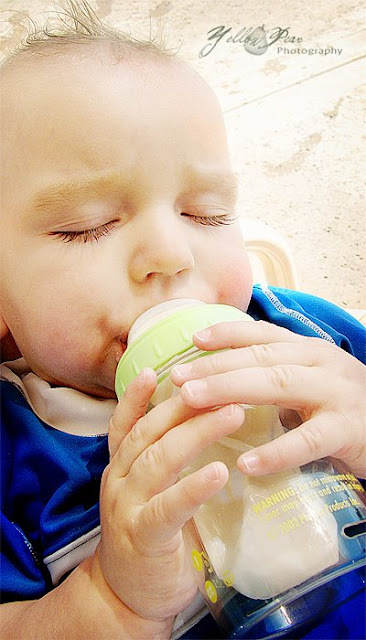 What a relaxed little guy and those eyelashes are fantastic!!!! I also enjoyed the cute sunny grins of you and Dennis. Looks like it was exhausting...such a funny oxymoron for the word "lazy river." Send your little Q over with me and my monkey's for the day next time! I do love your post about Q and his ability to climb those stairs...what cute legs he has and his facial expressions are so so so cute. Great black and white shot of you too Mrs. Beautiful! Hi! I love this post! Such beautiful COLORFUL photos! Great shots! 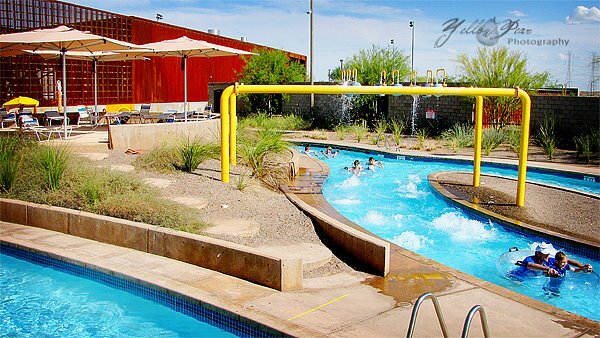 I am from AZ too and would LOVE to know where the indoor playground is and also where this amazing lazy river is located in Scottsdale. I am needing something "new" to do with my kids before school starts! Could you help me, please? Again, it was too much fun coming to see you guys! Your pictures turned out great from that day. Ryan and I just decided the other day that for our anniversary, we are going to take a day and go to a waterpark completely by OURSELVES! Then perhaps we will be able to relax and enjoy it! 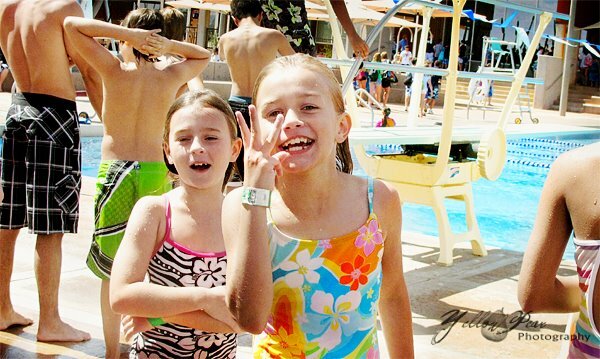 Hey I just bumped into your parents, J, J &L, Miss B, M & baby K at the water park on main street. Ash and I just happened to show up, it was fun. Miss B was so cute playing with Ash and when your dad told her it was time to go she said, "Aww, can we bring Ash home with us." She said Dennis is coming Monday. I would love for them to play together while he's here. Call me K..
Looks like fun, sorry about the kiddos ruining the lazy river, or I guess not ruining just spicing it up a bit.